It was late last Friday night. I decided I would spend a few moments reading the Bible. As I lay across my bed, I realized that I was not feeling normal. My entire body felt strange. I was sick. Fever with who-knows-what illness. I was engaged in a personal battle with a microscopic enemy and my body, equipped with God’s defenses for such things, was fighting back—-at a very respectable temperature of 103. Let’s just say that I was not enjoying the confrontation. Most things in my "regular" life stopped. No working, no cooking, cleaning, driving—I really didn’t even want to walk around. I was weak. Important things would just have to wait. Wait until when? When my strength was returned. 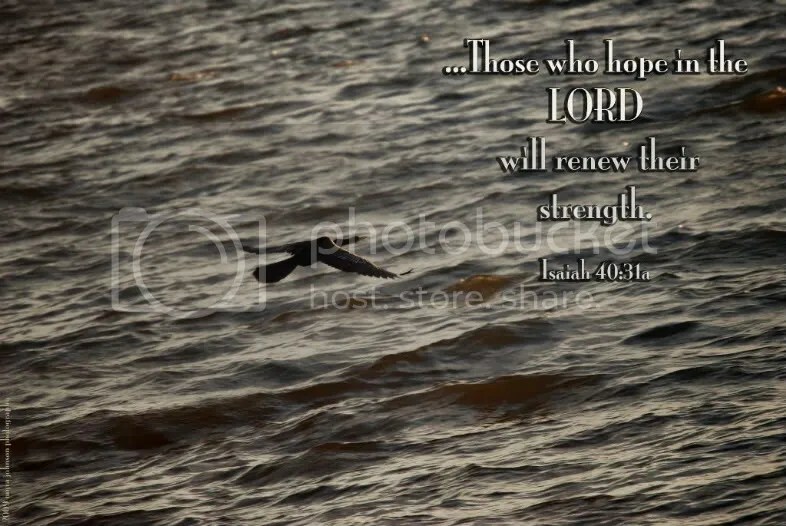 In Isaiah 40, we are told that "those who hope in the LORD will renew their strength." That seems to be implying that there will be times when our strength will be weakened and we will be in need of renewal. Speaking from a present struggle or from memories of past spiritual battles, one who knows of weakness and of strength yearns for the latter. May we remember to put our hope in God. I’m thankful that you’re better. You realize when you are sick that you have nothing if you do not have your health…no…I guess it is that you realize all you have is Jesus! Hope you are feeling better! Rolex Atmosphere Double ended up being primarily started inside 1964 while using purpose to be able to honor the air battle connected with UNITED KINGDOM. As a result, that series of pieces are generally connected with excellent impression. Also, they’re just the most affordable designs in whose prices include in no way exceeded 6000 cash. For the reason that that sequence possesses stored a large price tag connected with not necessarily becoming accredited by simply COSC. Even so, a really price continues to be above the feel of the many persons. The good news is, duplicate Rolex Atmosphere Double designer watches offer you the regular persons an excellent possiblity to feel extravagance during decrease price tag.